This is my latest felting creation. 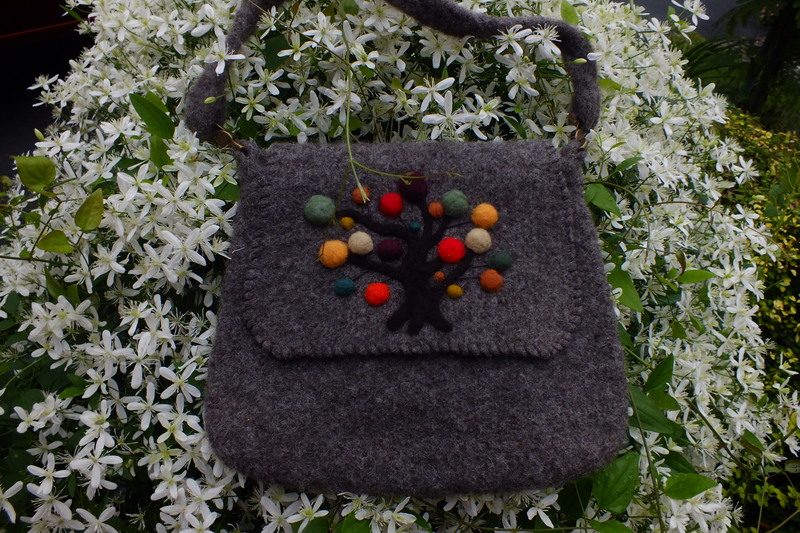 I used the same pattern that I made for another felted purse. That pattern might be in my blog. I saw the idea for the design on the front cover of a knitting magazine. 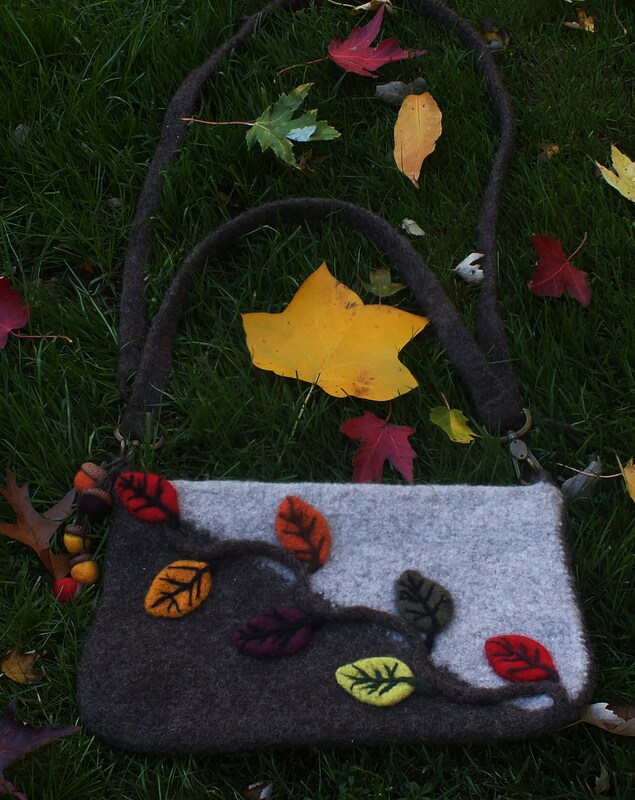 That picture of the front of a sweater just used the two colors of the purse for the leaves. It needed more color so I made my leaves in fall colors. I put swivel hooks on the strap that disconnect. I have a short handle and a longer handle in case someone wants to have a messenger bag. I also put a brown sport zipper in the top for total closure. 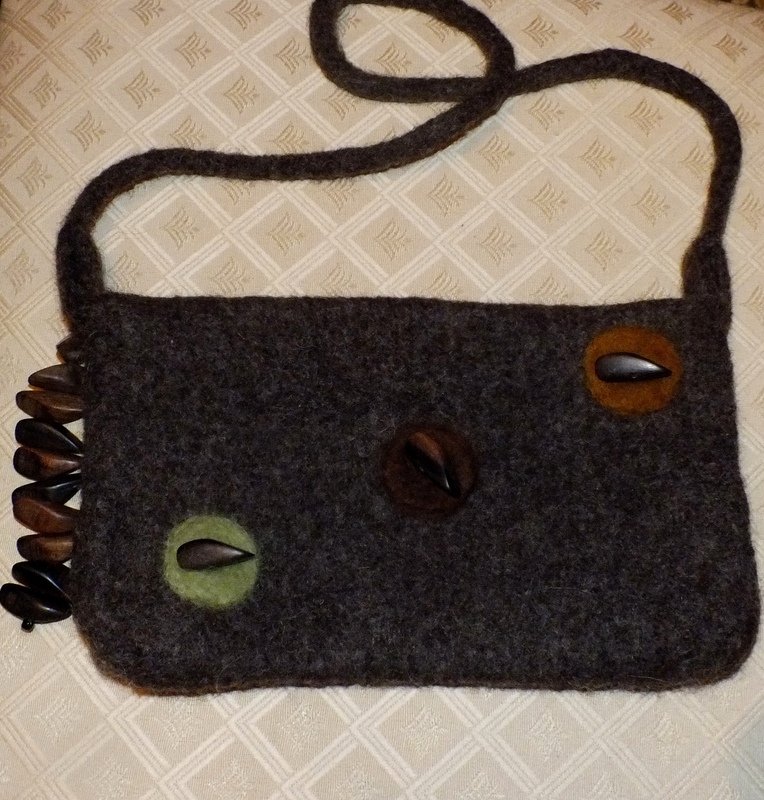 I also have felted acorns hanging from the hook on the left side of the purse. I had a woman that bought a purse from me with those on it and she said everyone she got a comment from on the purse said they liked the acorns. 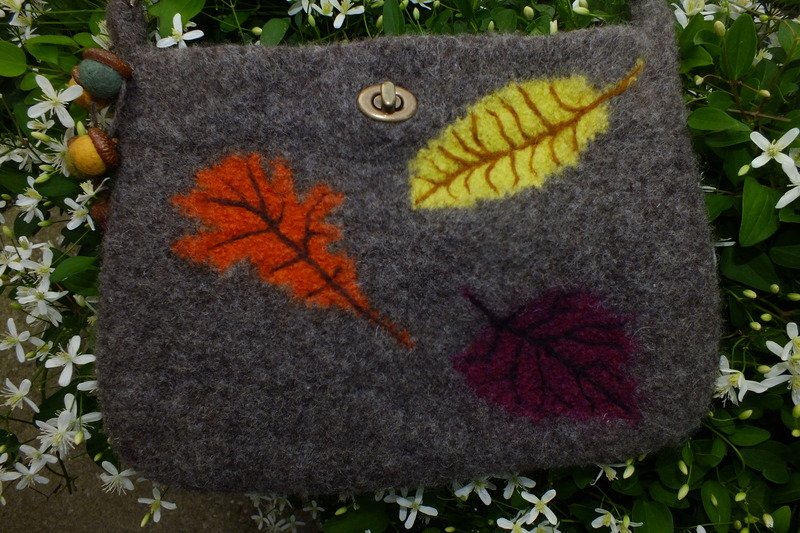 When I showed her the purse when I first finished, she told me to put the acorns on. The color of the purse is Natures brown and Oatmeal. It is really hard to get a picture of the brown yarn. For the diagonal design I knitted intarsia, decreasing every two rows. I decreased one stitch and knitted two rows, then I decreased two stitches and knit two rows. I continued that way so that the diagonal would go all the way to the right corner in the number of rows I had to work with. Things started out okay but drew a blank on how to do the fourth diagonal. It finally came to me after about three days. lol I finished it , sewed it together and felted it and was sick when I opened the washing machine. I had one beige color that was not wool!!! All that work, time and yarn wasted. So I went back and did it again. I made up several knitted leaves in all colors and felted them. 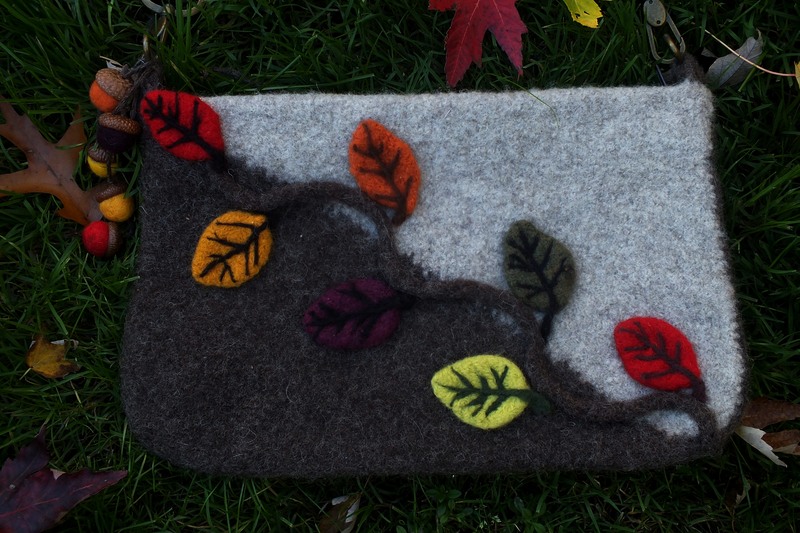 I had knitted this oak leaf first that is on this bag but it was way too large. When the little leaves looked funny I decided to felt the large oak leaf and it came out the perfect size. I only put one leaf on and one acorn. I put two pockets on the back piece inside. In my directions I explain how I attached it while knitting the back. You have to knit the pocket first to do this. I like the size and the way they both came out. 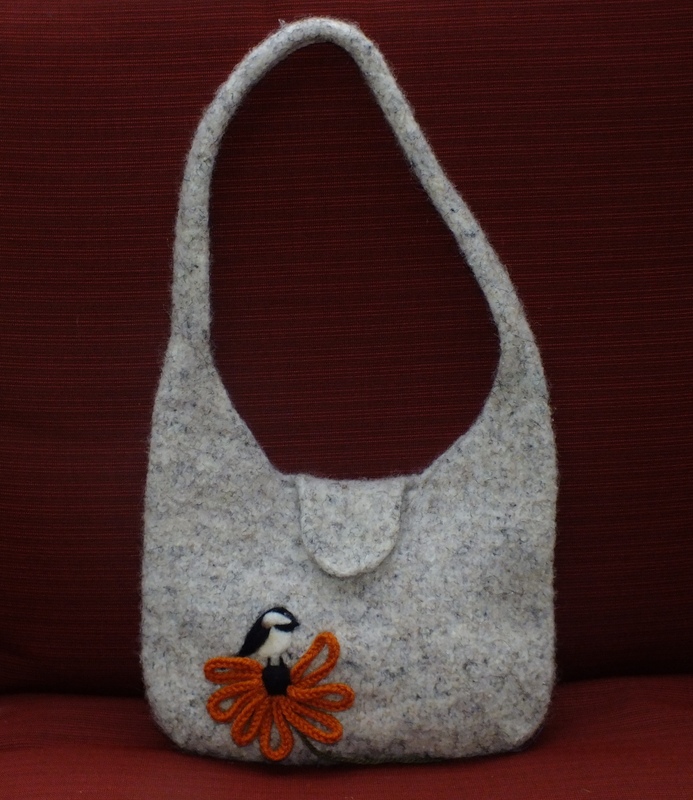 I needle felted a chickadee on one bag and used an “I” cord for the flower he is sitting on. Here are my directions. If you have any questions, don’t hesitate to ask. These are fun to make. 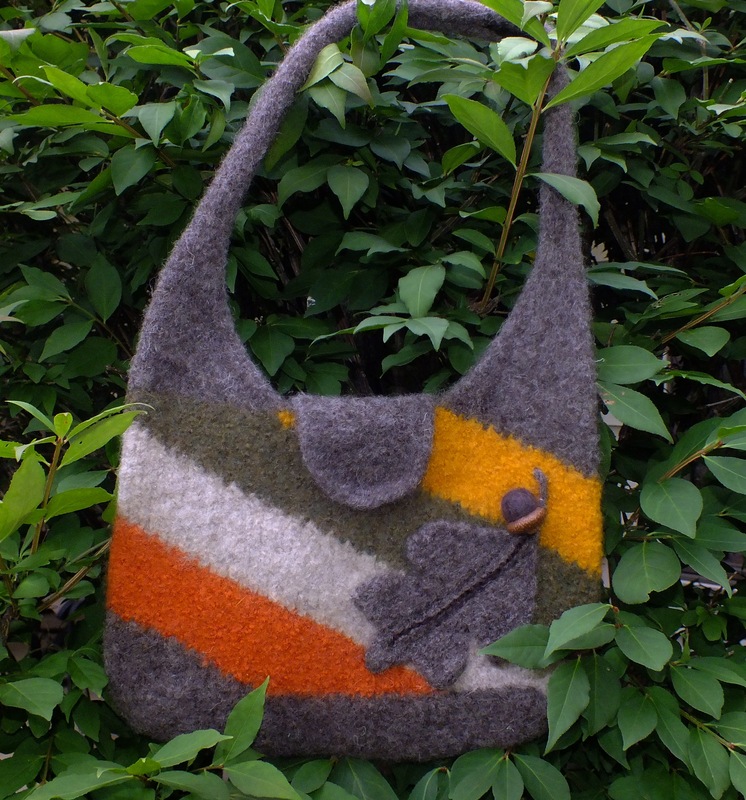 I knitted this purse and then felted in the washing machine. I came up with the idea of the design from a vintage wall hanging. I used my ball felter for the larger balls and needle felted the smaller ones. I used swivel hooks for the straps. I put braiding along the edge of the flap and used braiding on the tree . The size is 10 inches high and 12&1/2 wide. this purse is basically the same as the leaf purse I just finished but I used fewer stitches. When I worked on the back flap I increased stitches and knitted a total of 60 rows. If you would like to try this, the pattern is in my drop box. I got side tracked. What else is new? I had a very nice lady from Georgia buy a felted purse and mouse and felted slippers from my Etsy store. She wanted a purse for fall . She asked if the length of the handle could be adjusted. She got me thinking and all of a sudden I came up with a fall design and adjustable handles. First I knitted the fronts and backs in Intarsia. Did I tell you I hate intarsia work? Each side took me well over five hours. I found some swivel hooks that could attach to the purse.This way, she can change the handle to different lengths. 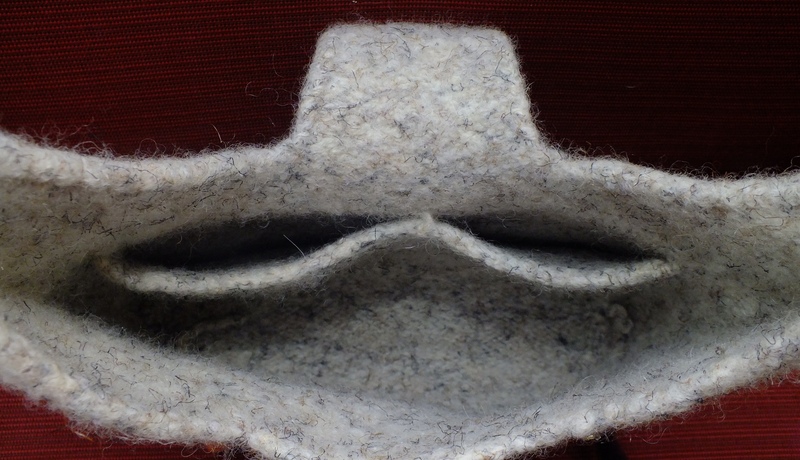 I sewed up the purse and went off to felt-the fun part. It took at least fifteen minutes to felt to this size. 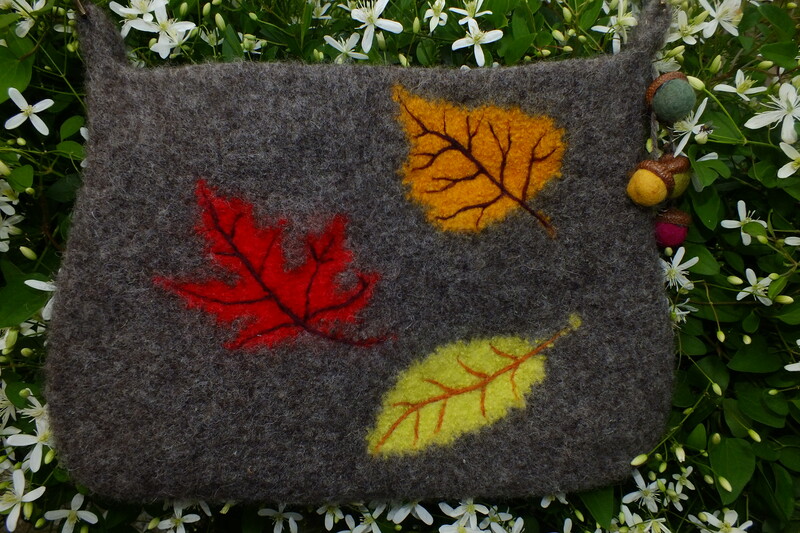 When the purse was dry, I needle felted the veins on the leaves. Another 4 hours. 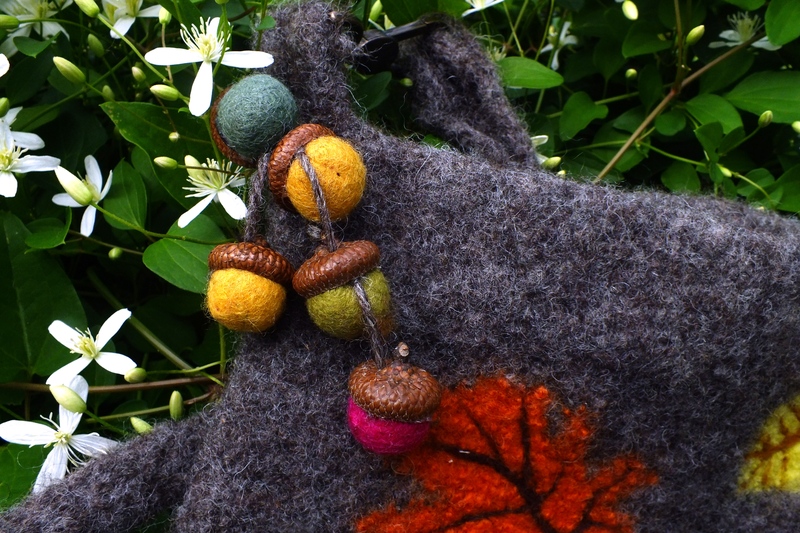 lol While I was needle felting I remembered on my other felted purse that I did a felted acorn. Well, my friend from Craft Gossip web site had given me a whole bag of felted acorns she made and I thought they would look cute hanging from the side. I had to get my drill out to drill holes in them to get the yarn through to hang them. Then I was going to put two magnetic clasps for closure but did not have any left in my stash. I did have this closure which was more expensive And I think it looks better on this purse. Now the strap. Oh brother…..I did not want to do an “I” cord because the handle comes out round. I wanted more of a flat strap. I just knitted ten stitches plain and felted and it looked awful. I was laying in bed and in the morning I wondered about knitting circular , no seam and it should lay flat. So I made a short one and felted in my table top felter. Yep, that works. I went back and went to knit it and realized I did not have a whole lot of yarn left. Uh, oh, better get this right. Meanwhile, the woman who bought the other items asked if she could see it. Yep, she wanted it. So I emailed her for the length she wanted and that was a good thing. When I felted the strap I wanted 19 inches in length because the swivel hook on each side took up 3 inches. I took it out at 21 and decided to put it in the dryer and eureka!!!! It went to the correct size. So I went to the post office today so she can take this purse on her trip to see her sister. The pattern I made up is in my drop box if you want to make it. I made the designs in DAK and then printed from DAK. I printed them out and scanned them and put them in the drop box. If you have trouble reading them I can save the file as a bmp or jpg and email it to you. Must be the cooler weather coming. 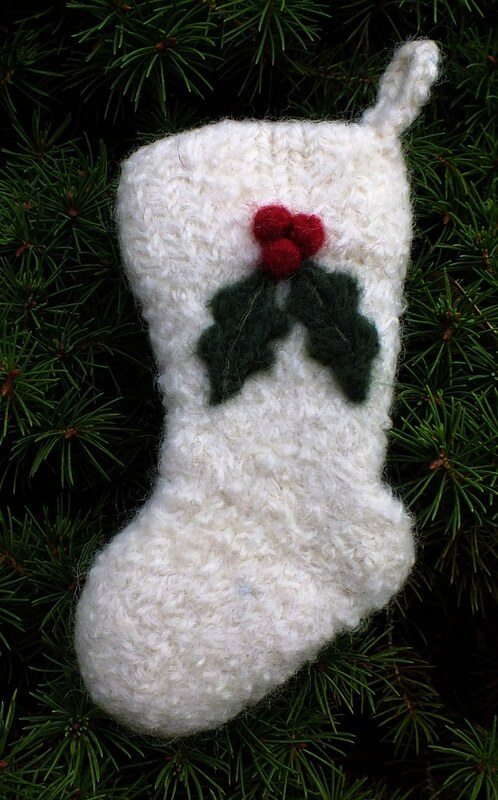 I found this hand knitting pattern and liked it. So I converted it to machine knitting but made it larger. Well…it does not look like the original. The sides were going to have a pleat but it did not felt well. So I was able to steam the pleat out and the shape is much nicer. I needle felted the circles and sewed the brown “beads” on top of each circle. Then I added a tassel of the beads to the left side. I decided to make the handle with the beads in it. I knitted 20 rows of 3 needle “I” cord and put a bead in and continued till I had 200 rows. I felted it in my table top felter and when I took it out it looked like a native necklace! Not sure if I liked it and then I noticed that the finish had come off of the beads and they were very dull. Can’t use that and it was just as well. So I went back and knitted another “I” cord and started and finished each end with 16 rows of stockinette to act like a tab on each side. I added a magnetic clasp for closure so it would not look funny with a button along with the design. I was happy when I started this and wrote everything down so I could share the pattern with you …ha, ha,ha…..what a waste of time. Not worth making it like this again. 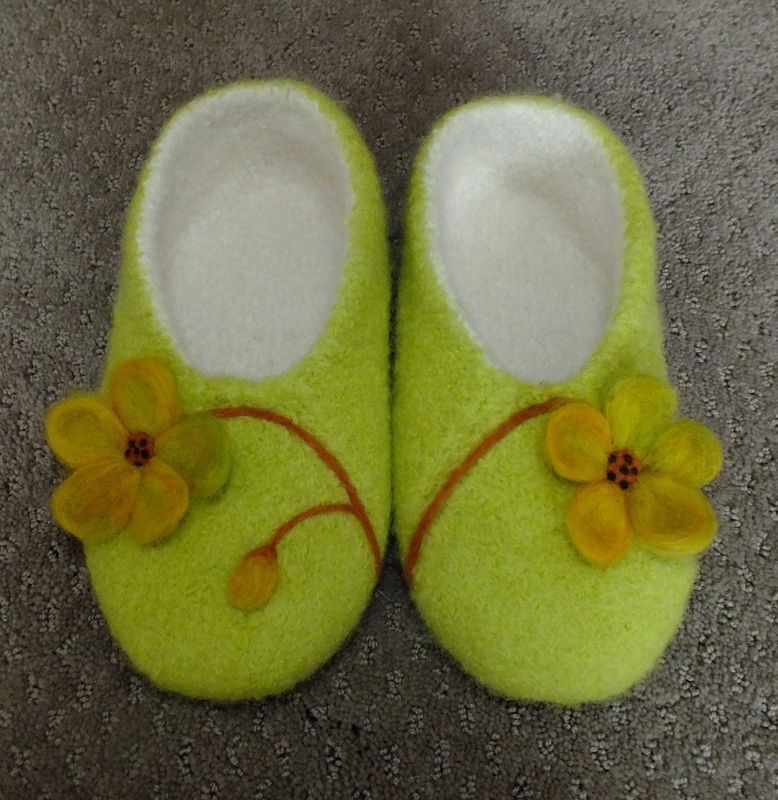 If you are going to try felting Diana Sullivan’s sew as you go lined slippers, here are some more suggestions. This is a woman’s medium size. I added four more stitches , two on each side to allow for more felting without getting too narrow. I will add 6 stitches when I do them again. I used tensions 7 and 8, 8 for the outer layer. I was not sure if I had enough cream color to do the whole lining so I just used it when I did the toe shaping. If you make these I would also tell you to stitch the seam closed with a piece of matching yarn so you don’t get lines. I used the seam to needle felt the stems so they matched. The wool I used was Paton’s. The roving is a blend of yellow, orange and green giving the petals a different shade from each other. I can’t tell you how light and good these feel on your feet. I think they feel lighter because you don’t feel side seams. They will be for sale in my Etsy shop and will have rubber circles on the bottom where the ball of the foot and the heel of the toe are so they don’t wear out. In fact, I put the rubber circles on the bottom of the ones I made in brown with the poppy and you don’t even feel that they are there. 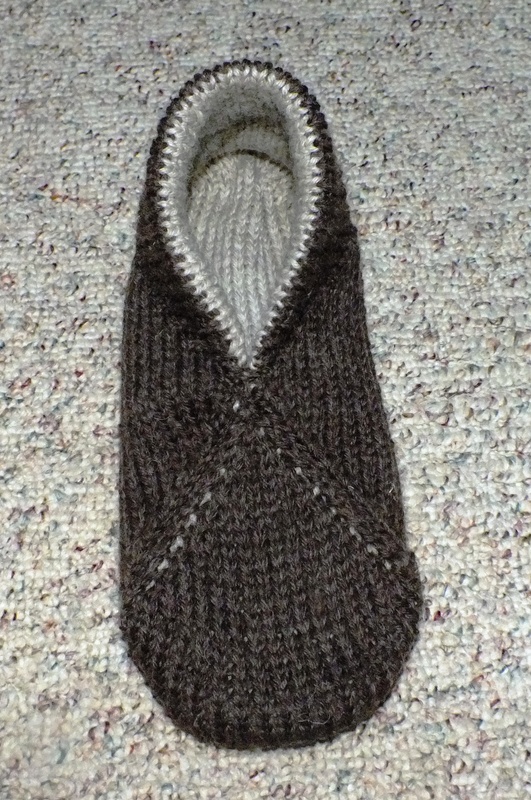 These slippers take about 6 ounces of yarn. After getting frustrated with trying that technique on my passap I had to walk away. I didn’t walk far though. I decided to sit on the floor and go through stacks of things that I hadn’t filed yet. I came across my hand out from the seminar I went to last September featuring Diana Sullivan . Her sew as you go lined slippers were so cute just knitted. While I was looking at them I decided to try to felt them. I knitted them on the Bulky machine using Natures brown wool and oatmeal for the liner. I used tension 7 for the liner and 8 for the outer part. I was doing well until it came to knitting the last triangle to sew as you go to close them and finish. I had a hand out sheet that was a little harder to do without the whole book and pattern and no pictures. So I left it on the machine and went back to it this morning. I decided to go ahead and knit and see what came out. I figured it out but had picked up the wrong stitch when I started the sew as you go and was a stitch off on the side. I went back and did it again and was successful. It is so nice doing this without sewing together when you are finished. Before I left the house this morning, I felted them and I love them. They are lighter than my other slippers and I think they take less yarn. I quickly felted a flower (that is slightly off center-lol) to see how they would look with a little bit of embellishment. Now here is my suggestion. Add about 8 to 10 stitches on width if you are going to felt them. This is a woman’s medium. The reason I would add stitches for width is because the seams on the toe show slightly . If I felted more on this one, they would have been for a child. It only took about 4 minutes to felt these. In the picture the inside of heel may look funny but it is just the indentation of my shoe stretcher that I put in for drying to my size. In a week I will try to post how you knit the sew as you go part. I know there is a lot of confusion on it from people that have tried. I also understand that the video has been removed on how to do it. It is simple but when you are told what to do you think huh? that makes no sense. Well worth trying it though. 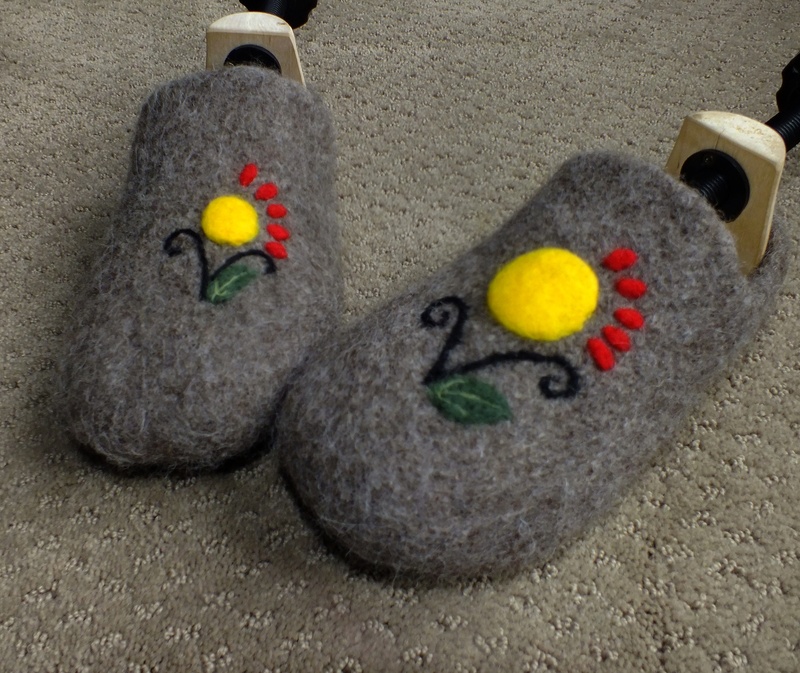 I am trying to fill my Etsy store for the Holidays so I made a pair of the felted slippers again. 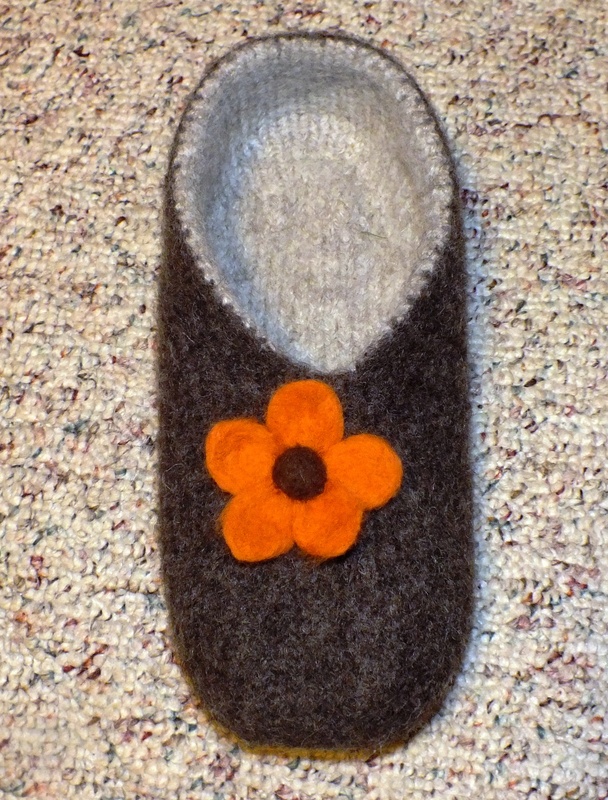 I needle felted the sunflower on the left foot and then I was just going to put a leaf on the other foot and it looked funny. So I just made another smaller one to distinguish the left foot from the right one. 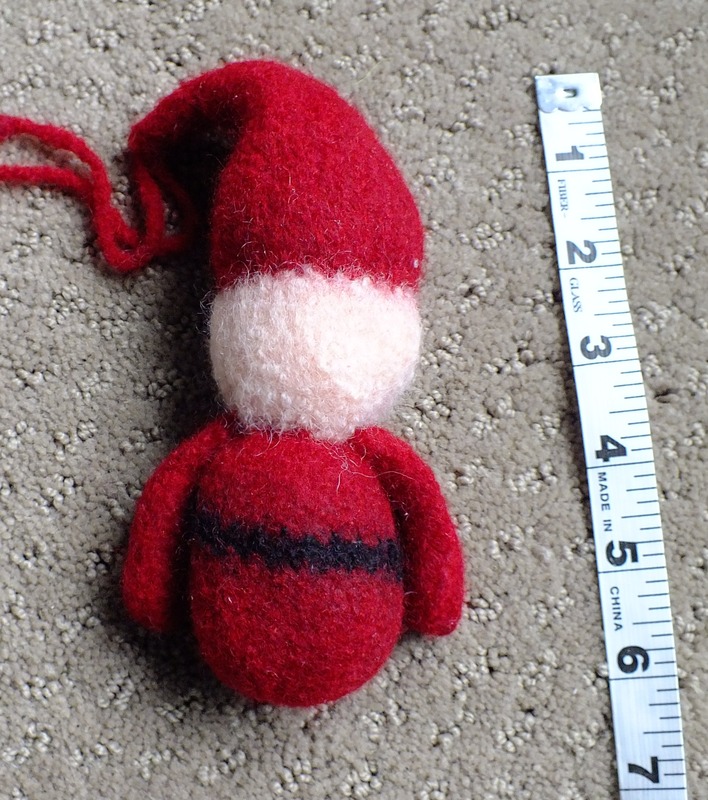 I needle felted this design a long time ago on a purse. I paid for the design from Dreamstime web site. Oh No, I am a liar. I told Lynne I would not try this again. However, my last little guy sold the night I put him in my Etsy store. A very nice woman by the name of Joann stumbled onto my blog and hurriedly went to my Etsy store to see if he was still there. She emailed me that she is starting needle felting and that she appreciates the time that goes into these things and she also said he was going to a good home. I am so happy he is going to get loving care he deserves . lol 🙂 She told me she hoped that I would not give up on doing him again. So, very motivated, off I go to the machine again. Yes, this took less time. I don’t think his face is as cute but this was a lot easier. 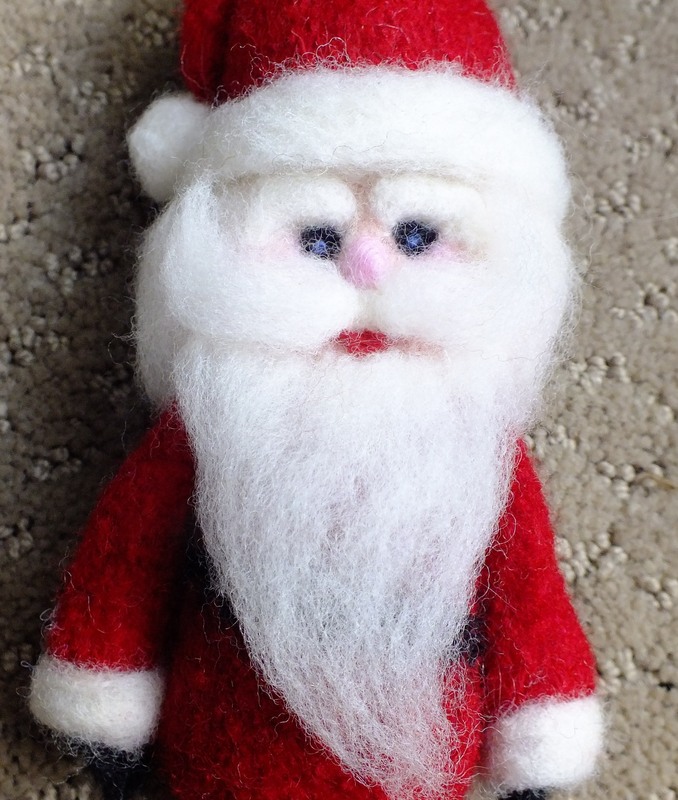 I knitted him without the cuffs, pom pom and brim and then felted him. I used my other roving that is not as white or silky but was much easier to control. I just compared the two Santas and I think I need to make his eye brows less bushy and move the eyes closer and put the blue part lower in the eye. I tried another ornament from Kay Furfaros’s book. I followed her pattern but just put my tension up at 8.. and it came out a decent size. It is 5 inches long and about 3 inches at the widest part. I then needle felted some holly and berries on it. THe stocking opens up to put things in like money but not wide enough for a gift card. This did not take long to do so I don’t have to charge 50 dollars for it in my Etsy store!